In 1978 I was blessed with a unique experience. One afternoon I found myself in Chitwan National Park, Nepal, getting off an elephant, walking through 20 ft. high grass, and coming face to face with a 350 pound Bengal tigress. Though she was sedated, her eyes were open, staring at me, and her breathing was loud and heavy. The afternoon was spent helping research scientist David Smith cool her down with water, taking vital measurements, and fitting her with a radio collar for future tracking. We sat on the elephants, late into the night, until she could safely get up and stumble into the forest. It was not until 1991 that I realized the power the tiger held on my psyche. 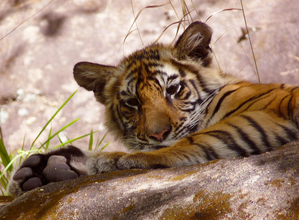 I began hearing stories of a new and insidious threat to tiger populations in India and Nepal. For the first time I heard about tigers being killed for their bones. This information came from respected wildlife and conservation experts as well as published reports from conferences in India. Some famous tiger reserves had suffered near catastrophic losses in just two years. Indeed, the great tiger reserves of India and Nepal had become shopping malls to satisfy a market based on ancient Chinese medicinal practices and customs. In 1993 I spent the afternoon with a brave and dedicated Deputy Warden at Chitwan, Tikaram Adhikari. We talked about the poaching threat to the tigers and visited some miscreants in the local jail who been caught in a sting operation trying to sell tiger bones and rhino horns. I decided to do something to help. In 1994 I started the Save the Tiger fund raising trip with Mountain Travel/Sobek. This has proven highly successful and next March 2010 will be the 15th departure. [The trip was featured in a November 11, 2007 San Francisco Chronicle story by Travel Editor John Flinn]. The money raised from that first trip had a very positive effect in helping the anti-poaching campaign in Chitwan. When I saw how effective a relatively small amount of money could be when given to the right people for the right project, I decided to expand my base of support and establish an independent organization to help block the tiger's path to extinction. The Fund For The Tiger was incorporated in the State of California as a non-profit organization on August 25, 1995. The Internal Revenue Service granted tax-exempt public charity status on March 5, 1996 and the California State Franchise Tax Board followed with a tax-exempt ruling on May 10, 1996. Contributions are tax deductible within the limits of the law under section 501 (c) (3) of the Internal Revenue Code. I am pleased and grateful for the assistance of two highly experienced people who have joined The Fund as Board of Directors- Erica Stone, President of the American Himalayan Foundation and Larry Habegger, Editor of the Travelers' Tales book series.